The official website for Kakuriyo -Bed & Breakfast for Spirits-, the television anime of writer Midori Yūma and illustrator Laruha's Kakuriyo Yadomeshi (Afterlife Inn Cooking) light novel series, began streaming a new promotional video for the anime on Friday. The video previews the show's second half, which will start in July. The video also previews Megumi Nakajima's new ending theme song "Shiranai Kimochi" (Unknown Feelings). The website also revealed more cast and a new key visual on Friday. 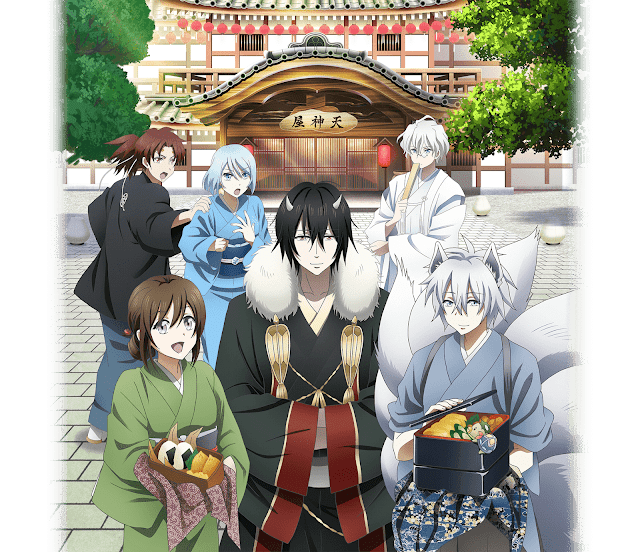 The second half of the anime will center on Orio-ya, the rival inn to the Tenjin-ya. The anime premiered on April 2, and it will have a total of 26 episodes. Crunchyroll is streaming the series as it airs in Japan, and Funimation will stream an English dub. Yoshiko Okuda (animation director for The Perfect Insider, Casshern Sins) is directing the anime at GONZO. Tomoko Konparu (Utano☆Princesama Legend Star, Kimi ni Todoke) is in charge of series composition, and Youko Satou (Saiyuki Reload Blast, Dog & Scissors) is designing the characters. Takurō Iga (Fuuka, Aria the Scarlet Ammo AA) is composing the music, and Flying Dog is handling the music production. Nao Tōyama is performing the opening theme song "Tō no Manimani," and Manami Numakura is performing the first ending theme song "Sai -color-." The series centers on a female college student named Aoi (voiced by Nao Tōyama), who inherited the ability to see spirits from her late grandfather. Aoi prides herself on her cooking. One day she's feeding some agricultural spirits when suddenly a god and the master of the Tenjin-ya inn appears and takes Aoi away. He says that due to her grandfather's debts, she must become his bride. Aoi hates this idea and instead declares that she will pay back her grandfather's debt by working at the Tenjin-ya. Yūma launched the novel series in Kadokawa's Fujimi L Bunko imprint in 2015, and Kadokawa published the eighth volume on April 13. As of last October, the series has more than 340,000 copies in print. Wako Ioka is drawing a manga adaptation in Kadokawa's B's Log Comic magazine and website, and the manga's fourth volume shipped on March 31. Viz Media has licensed the manga.